The search function is pretty good at finding every task or file related to your search query (even on completed tasks). Tagging projects and tasks helps our team keep campaigns organized instead of just floating around somewhere in Asana. When you upload images, they upload with a thumbnail preview so you can see what the file is before even opening it. The addition of “boards” allows our team to move projects from one stage to the next and is a nice visual element to Asana. The “copy task” functionality saves me time on repeated tasks, which is huge for me each week. The abiilty to “pin to top” is especially helpful for long threads because you can keep important messages and/or files in clear view instead of buried within a long conversation back and forth with team members. Finally, the two-verification method when deleting a task is nice because the platform doesn’t just get rid of something immediately–it makes you confirm it before deleting it from the backend. The biggest drawback of Asana for me is the inability to edit comments. Users can only delete and type a new one. This seems like a simple thing to add especially when followers and @ mentions get an email notification of every new update to a task. The search function is pretty good at finding every task or file related to your search query (even on completed tasks). Tagging projects and tasks helps our team keep campaigns organized instead of just floating around somewhere in Asana. When you upload images, they upload with a thumbnail preview so you can see what the file is before even opening it. The addition of “boards” allows our team to move projects from one stage to the next and is a nice visual element to Asana. The “copy task” functionality saves me time on repeated tasks, which is huge for me each week. The abiilty to “pin to top” is especially helpful for long threads because you can keep important messages and/or files in clear view instead of buried within a long conversation back and forth with team members. Finally, the two-verification method when deleting a task is nice because the platform doesn’t just get rid of something immediately–it makes you confirm it before deleting it from the backend. The biggest drawback of Asana for me is the inability to edit comments. Users can only delete and type a new one. This seems like a simple thing to add especially when followers and @ mentions get an email notification of every new update to a task. 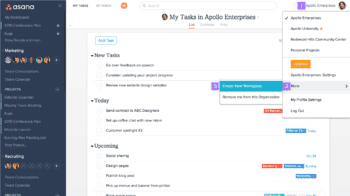 Used in the correct way, Asana makes it so that tasks can be prioritized, assigned, followed, collaborated on, completed, recorded, and never forgotten. It has allowed me to perform better at my job. Instead of 1000 sticky notes all over my desk and computer, I have 0 ever since we started using Asana. It allows me to see all my priorities in 1 place so that I can start with the most urgent projects. It helps me perform way better at my job, keeping our clients and my boss happy. I’ve tried a couple other competing softwares and Asana is the best in my experience. There is a slight learning curve to get the hang of all the most basic functionality in Asana. Example: creating sub-tasks within tasks, within projects, assigning tasks, adding task followers, setting due dates and times. I’m sure there are a lot of other cool things I could be doing on Asana, but I just haven’t learned them yet. At least 3X’d my personal productivity. Increased accountability for me and everyone in the company. Helps us put first things first, maximizing the results of our individual and collective work. Allows us to fast-track tasks that used to have complicated timing with back-and-forth hand-offs. Enables managers to set due dates and times, so there’s no question on when something needs to be done. Projects allow for major subdivided categories of our business to be organized and visualized. 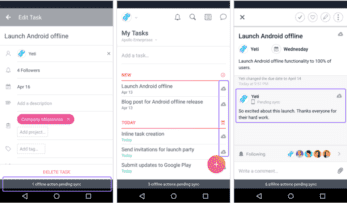 Used in the correct way, Asana makes it so that tasks can be prioritized, assigned, followed, collaborated on, completed, recorded, and never forgotten. It has allowed me to perform better at my job. Instead of 1000 sticky notes all over my desk and computer, I have 0 ever since we started using Asana. It allows me to see all my priorities in 1 place so that I can start with the most urgent projects. It helps me perform way better at my job, keeping our clients and my boss happy. I’ve tried a couple other competing softwares and Asana is the best in my experience. There is a slight learning curve to get the hang of all the most basic functionality in Asana. Example: creating sub-tasks within tasks, within projects, assigning tasks, adding task followers, setting due dates and times. I’m sure there are a lot of other cool things I could be doing on Asana, but I just haven’t learned them yet. At least 3X’d my personal productivity. Increased accountability for me and everyone in the company. Helps us put first things first, maximizing the results of our individual and collective work. Allows us to fast-track tasks that used to have complicated timing with back-and-forth hand-offs. Enables managers to set due dates and times, so there’s no question on when something needs to be done. Projects allow for major subdivided categories of our business to be organized and visualized. It doesn’t take us long to onboard new users, because it’s ridiculously easy to use! Because it’s so free-form sometimes staff members end up changing things that they shouldn’t. It also is missing the ability to have conversations and comments that are private to a team on public tasks. 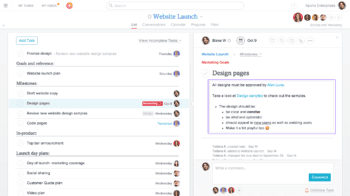 We’ve developed a custom solution that lets us bring in work order requests into Asana for different departments (Marketing/IT/Facilities), and then collaborate inside Asana. By putting work orders into Asana we’ve reduced our dependence on email, and increased visibility into work that’s getting done across our organization. We also use it inside departments for organizing tasks, planning events, and general project management. The only real bummer with Asana is the tiered pricing structure. Asana provides a lot of value, but it shouldn’t cost you more per user the more users you have… it should be less. Drop email and make the jump to Asana, with the new boards feature it’s constantly improving, and has been incredible for our team. It doesn’t take us long to onboard new users, because it’s ridiculously easy to use! Because it’s so free-form sometimes staff members end up changing things that they shouldn’t. It also is missing the ability to have conversations and comments that are private to a team on public tasks. 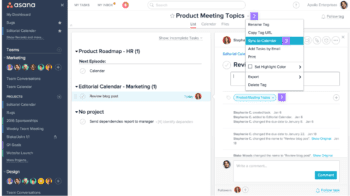 We’ve developed a custom solution that lets us bring in work order requests into Asana for different departments (Marketing/IT/Facilities), and then collaborate inside Asana. By putting work orders into Asana we’ve reduced our dependence on email, and increased visibility into work that’s getting done across our organization. We also use it inside departments for organizing tasks, planning events, and general project management. The only real bummer with Asana is the tiered pricing structure. Asana provides a lot of value, but it shouldn’t cost you more per user the more users you have… it should be less. Drop email and make the jump to Asana, with the new boards feature it’s constantly improving, and has been incredible for our team. As a Project Manager at a mid-sized software company, I HAVE to have a big picture overview of all work being done: who is doing what, when the deadlines are, and when tasks are completed and approved. And, I need to be able to see what’s going on from anywhere at any time. 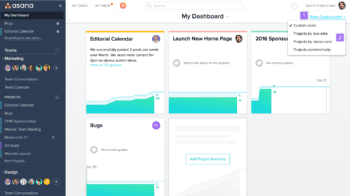 Before we started using Asana, it was incredibly difficult to track all of our projects and I used several data silos to manage all of the details. Asana was a life saver for me because not only does it allow me to see all of the work/tasks assigned to individuals, but my team uses it to communicate with each other – and I can view all of their communications for reference as needed. We also use the integration with the time tracking software, Everhour, and it worked really well for us. The dashboard and reporting functionalities are extremely easy to read, and give a great overview of progress. The free version is an incredible platform on its own, and upgrading to premium is extremely reasonable considering all of the extra reporting functionality you receive. This is a great program for companies that need a simple and intuitive solution for managing projects that require high communication and fast results. It would be nice if the interface was more customizable for the purpose of displaying data in ways that would be most helpful for each individual user. Currently the display (of projects and task lists) is fairly inflexible, but, it’s very easy to use. Asana does not have gantt charts or any micro level management tools used for budgeting, which is why I recommend using Asana for the communication and deadline aspect of projects, but NOT for carrying out PM responsibilities required for most successful projects. As a Project Manager at a mid-sized software company, I HAVE to have a big picture overview of all work being done: who is doing what, when the deadlines are, and when tasks are completed and approved. And, I need to be able to see what’s going on from anywhere at any time. 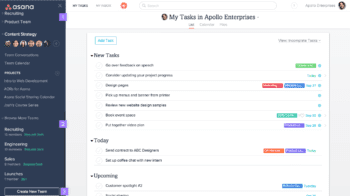 Before we started using Asana, it was incredibly difficult to track all of our projects and I used several data silos to manage all of the details. Asana was a life saver for me because not only does it allow me to see all of the work/tasks assigned to individuals, but my team uses it to communicate with each other – and I can view all of their communications for reference as needed. We also use the integration with the time tracking software, Everhour, and it worked really well for us. The dashboard and reporting functionalities are extremely easy to read, and give a great overview of progress. The free version is an incredible platform on its own, and upgrading to premium is extremely reasonable considering all of the extra reporting functionality you receive. This is a great program for companies that need a simple and intuitive solution for managing projects that require high communication and fast results. It would be nice if the interface was more customizable for the purpose of displaying data in ways that would be most helpful for each individual user. Currently the display (of projects and task lists) is fairly inflexible, but, it’s very easy to use. Asana does not have gantt charts or any micro level management tools used for budgeting, which is why I recommend using Asana for the communication and deadline aspect of projects, but NOT for carrying out PM responsibilities required for most successful projects. Before Asana, I usually had to write down everything that I wanted to keep track of either on a sheet of paper or my forgetful, work saturated mind that would either be forgotten or thrown away. Now I can just write them down in a blink of an eye and have the program track my cases and notify me when they are due. I can now have absolute oversight on my entire department, team, and company. Being organized has never been so productive! There are not that many cons when using Asana, but there still exist one or two to mention. One being that their Customer Support does not have direct and fast communication system that can definitively make you uneasy when in a rush. A few features and a bit hidden and could be forgotten how they are used by the user due to the complexity of the UI that can definitively be improved with a little tweaking and customer feedback. I can finally keep track of what is important for each day without forgetting or losing any notes, details, contact etc. I have everything right there when and wherever I want it. Before Asana, I usually had to write down everything that I wanted to keep track of either on a sheet of paper or my forgetful, work saturated mind that would either be forgotten or thrown away. Now I can just write them down in a blink of an eye and have the program track my cases and notify me when they are due. I can now have absolute oversight on my entire department, team, and company. Being organized has never been so productive! There are not that many cons when using Asana, but there still exist one or two to mention. One being that their Customer Support does not have direct and fast communication system that can definitively make you uneasy when in a rush. A few features and a bit hidden and could be forgotten how they are used by the user due to the complexity of the UI that can definitively be improved with a little tweaking and customer feedback. I can finally keep track of what is important for each day without forgetting or losing any notes, details, contact etc. I have everything right there when and wherever I want it. Founded in 2008 in San Francisco, Asana is one of the fastest growing SaaS companies ever. It offers a workplace management solution that is simple, affordable and packed with great features. Asana was named Editor’s Choice by PCMag and praised on Freakonomics Radio. The founders are Justin Rosenstein, who has helped to create tools such as Google chat and Facebook’s “like” button, and Dustin Moskovitz, one of the co-founders of Facebook, Inc. 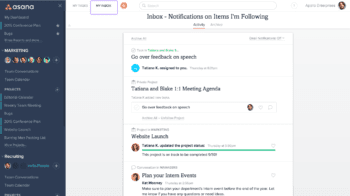 Despite their former careers creating tools which have contributed to much workplace distraction, their mission in creating Asana is to do just the opposite and help teams to focus, prioritize and be productive. 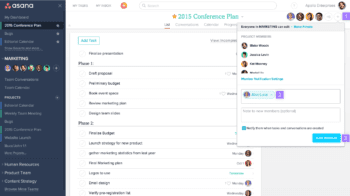 Asana is a powerful platform, but also very usable. It allows members to easily take ownership of tasks and see the big picture. The timeline and dependencies features are great tools for tackling large complicated projects, but the basic free version is a powerful option for teams that don’t need any extra frills. *Plans of 15 or fewer qualify for a small team discount, so the price per user per month is $6.25 when billed annually, and $7.50 when billed monthly. 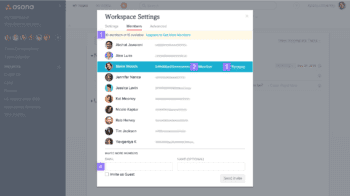 Manage team members with advanced admin controls like service accounts and SAML. Get specialized help from our customer success team, plus same day support to ensure you’re successful with Asana. Maintain strict control over your data and security with user provisioning and deprovisioning, data deletion, and cross-regional backups. Put your logo front and center. With custom branding, you’re able to customize Asana with your own logo. Beta – Get early access to Portfolios to help track the status of important projects. What Do You Think of Asana?